Shaheen Shah Afridi ended the ODI series against New Zealand with 9 wickets, behind only Lockie Ferguson's 11 wickets, but at a better average and strike rate. Shaheen's 9 wickets consisted of two 4-wicket hauls in each of the first two ODIs and before rain spoiled the match last night, he had already got rid of Colin Munro. Who knows how many more he would have got had the match been completed. Deservedly so, the 18 year old left arm pacer was adjudged Man of the Series. Shaheen has been a great find for Pakistan. Only 6 ODIs old, his bowling stats are astonishing, more so because he has played all his ODIs in the UAE, where pitches favor either the batsmen or the spinners. 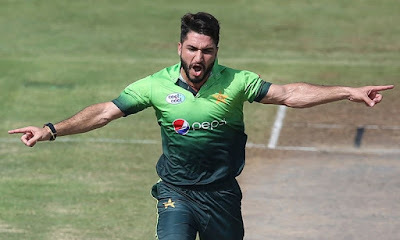 Shaheen's 13 ODI wickets in 6 games have come at an average of 17.61, an economy rate of 4.88, and a strike rate of 21.6 - that is a wicket every 4th over he bowls in ODIs! Even in T20Is, Shaheen has been quite effective picking up 11 wickets in 7 games at an average of 18.45. I really want to say "ek Afridi gaya, ek aur aa gaya" but this is more about the pace talent that Pakistan keeps on churning out. 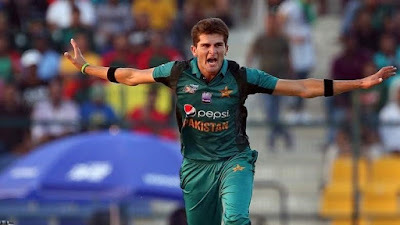 Just when Pakistan is feeling that they may have lost their star left armer Mohammad Aamir, they have found Shaheen Afridi who seems to improve with every match he plays. He has just made it to Pakistan's test squad for the series against New Zealand and the prospect of seeing him bowl with the red cherry is even more exciting. Another exciting left armer with a bright future for Pakistan is Usman Khan Shinwari. Why he did not play a single ODI against New Zealand is beyond me. Especially at a time when Hasan Ali was struggling for form. Usman's ODI record is even better than Shaheen's! 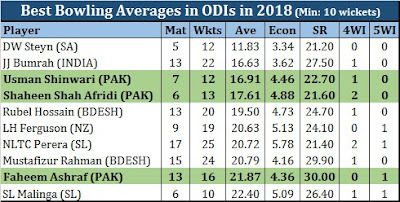 In 9 ODIs, Usman has picked up 18 wickets at an average of 15.27, economy rate of 4.66, and strike rate of 19.6 - better than Shaheen in all three areas. Which makes it really strange that he was on the bench against New Zealand. 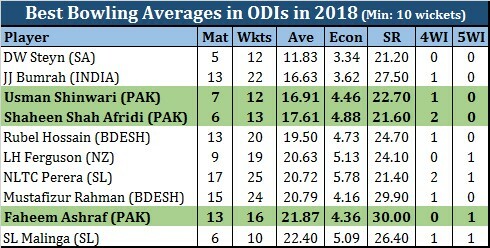 Among all pacers that have taken at least 10 wickets in ODIs in 2018, Usman and Shaheen are right up there in terms of their averages. Both of them are among the only 5 pacers in the world with an average under 20 this year. Plus, Shaheen's strike rate is among the absolute best, right up there with Dale Steyn's. Together, Usman and Shaheen can form a potent new ball attack, which can be extremely dangerous in South Africa early next year and then in England during the World Cup. Both of them have tremendous potential and have made it much easier for Pakistan to not miss a struggling Mohammad Aamer.